Unbelievable Sea Creatures with Submarine Monkeys, Cats Scuba Divers and Sunken Pirate Ship! 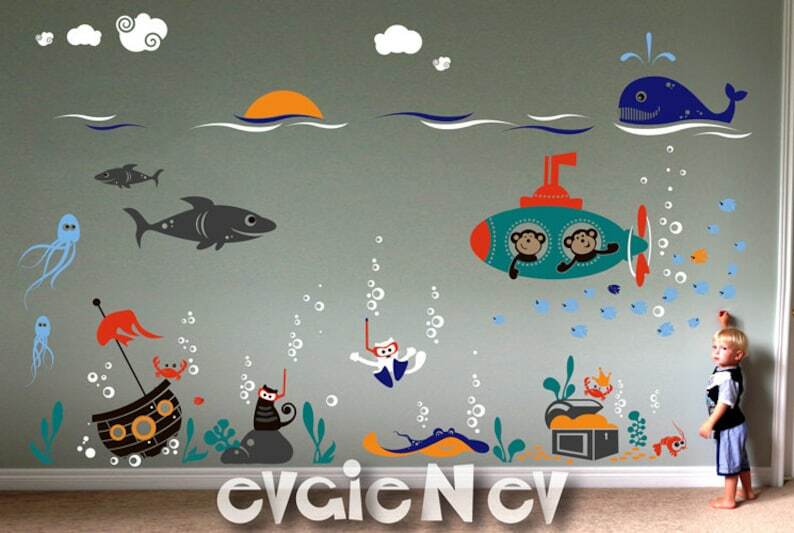 Underwater World with Ocean Friends and Sea Life Wall Decals features NEW item. Elements come separately and can be arrange any way you'd like. Custom colors available. FREE testing decal is included. Simple to put up and fun for kids! Color changes are available at no additional charge and you can choose up to 7 colors from our color chart. Please remember to choose ONE single color FOR ONE another single color. For example, all elements in ORANGE to the same elements in TEAL. Looking for something different but haven't found it yet? Having your own idea in mind and craving to see it on your wall? Drop us a line with your questions, feedback, or just to claim code 'space25' on checkout. Be patient when applying and turns out great. Our son loves his underwater scene in his bedroom. Great quality. With patience the stickers went on smoothly. My mother-in-law now would like to get some!